Shakespeare is at the center of the Anglophone literary universe. While there was undoubtedly a real William Shakespeare back in the 16th and 17th centuries, the exalted author, The Bard, is a cultural construction of considerable sophistication and complexity. That complexity exceeds my knowledge, but I want to at least indicate its outlines. So, imagine you attend a performance of some Shakespeare play. This performance is a “standard” performance, no Shakespeare in modern dress, no avant-garde scenery, no fancy lighting. Just Shakespeare the “old-fashioned” way. The text, though, will be spoken with modern pronunciation, not Elizabethan, which would be something of a specialty item in any event, so special that it would likely qualify as avant-garde. Moreover, whatever edition the director chooses is likely to have bits cut here and there. Why? Because most Shakespeare plays run a bit long and it’s standard to cut parts out. Moreover, it’s likely to have scenery, which will, in turn, require breaks to change it. The Elizabethan theater didn’t use scenery, hence no breaks for changes, and things moved along at a quicker pace. Thus whatever you see is not going to be what played in Shakespeare’s London. As for that text, the one the director cut, where’d it come from? Not Shakespeare, not quite. The spelling will be both modernized and regularized, but that’s relatively minor, though not without consequence, as we will see. Of more consequence is the fact that we have no manuscripts by Shakespeare and no explicit connection between the man we know to be a glover’s son and actor and the printers who published the plays. The only thing that connects them is the name and various circumstances. Hence there is a minor industry devoted to figuring out who the real Shakespeare is. Why not the glover’s son? you ask. Well, so the story goes, whoever wrote the plays was well educated, but there’s little evidence that the glover’s son had more than a grammar school education, if that. Besides, he was a mere commoner. And so it goes . I have little interest in that discussion and mention it only to indicate how iffy our knowledge is and to indicate just how much of a construction the historical Shakespeare is. Of even more consequence is the fact that each play exists in two or three early versions. So the text that gets acted or that one reads will have been edited from those early texts. In some cases the differences between the texts are relatively minor, but that’s not the case with Hamlet, which is at the center of Shakespeare’s oeuvre. We’ve got three texts. One is roughly half the length of the other two, which differ from one another in 10% of their lines. Differences of that magnitude cannot be called minor. So the Hamlet you read or see acted on the stage is likely an eclectic text based on one of the two longer versions with appropriate modifications made by an editor. And, until fairly recently, the editor’s objective would have been to produce the one true text, the best version, the real Hamlet intended by Shakespeare himself (whoever he was). Shades of Plato! Where did those Hamlet texts come from? Here I’m not thinking about the fact that the Hamlet story is older than Shakespeare. I have something different in mind. When a modern playwright writes a play, they do so with the intention that it will be performed by whoever pays the licensing fee. Shakespeare – the London actor and glover’s son – didn’t work that way. He wrote for the company he was attached to (and in which he owned shares). He knew who was going to act the parts. Do you think, then, that he would have suited the parts, not to some ideal actor, but to the real actors in his company? Is it even possible that those actors may have suggested things to him that he then incorporated into his script? Is it further possible that the published texts might reflect improvisations the actors offered up during performance and that Shakespeare incorporated into the text that he sent off to the printer? We don’t really know. In making this last round of remarks I’m thinking of a rather different and more recent artist, Duke Ellington. Ellington didn’t write for any band in general; he wrote specifically for his band. His personnel were relatively stable, as those things went, with some musicians staying with him for decades. And we know that he took ideas from his musicians – and some have complained bitterly about it. It’s not unreasonable to speculate that Shakespeare might have done the same. The New Oxford Shakespeare, for which Taylor serves as lead general editor, is the first edition of the plays to credit Christopher Marlowe as a co-author of Shakespeare’s “Henry VI,” Parts 1, 2, and 3. It lists co-authors for fourteen other plays as well, ushering a host of playwrights—Thomas Nashe, George Peele, Thomas Heywood, Ben Jonson, George Wilkins, Thomas Middleton, and John Fletcher, along with Marlowe—into the big tent of the complete works. This past fall, headlines around the world trumpeted the Marlowe-Shakespeare connection, and spotlighted the editors’ methodology: computer-aided analysis of linguistic patterns across databases of early modern plays. “Shakespeare has now fully entered the era of Big Data,” Taylor announced in a press release. I note that computational stylometrics has been around for half a century now. I have no serious opinion on this work, but it is consistent with my view of these matters. My point, then, is that when you attend a performance of Shakespeare, the lines you’re listening to were created by a committee, albeit one spread out in space and time. There is little doubt that the glover’s son was the chief and by far the most important and influential member of that committee, but other hands and other minds have been messing with the text. Now imagine that you are a literary critic and that you are going to write an interpretive essay about, say, Hamlet, the sort of essay that makes the sorts of claims about meaning that cannot, in the end, be strongly justified. Until quite recently you would have worked from an eclectic text based on one of the two longer originals, with ‘improvements’ as the editor saw fit. In the last decade or so editorial theory – and, believe me, there is such a thing – has gotten to the point where at least some scholars think we need to work from the originals, not from an eclectic text. Regularize and modernize the spelling, correct printer’s errors and such, but otherwise leave the text alone. In this situation what does it mean to talk about the meaning of Hamlet? What is this thing, this Hamlet? At this point you might be thinking that these Shakespeare texts are almost as mystified as the Bible. The Biblical texts of course are much older, and we know considerably less about the circumstances of their creation, assembly, and transmission. Thus our best accounts of these texts are at one and the same time more elaborate and less definitive than our accounts of the Shakespeare texts. But in both cases there comes a point where the cultural apparatus we’ve built around the texts simply disappears. If you will, it sinks into the dark matter of society’s mind and becomes invisible. What remains visible is, in one case, the powerful though mortal word of The Bard, and in the other case, the sacred and immortal Word of God. Let me push this just one step further. Shakespeare as we know him today is an emic construction created by a tribe of academic specialists working from a somewhat limited collection of (etic) objects – early editions of the plays plus a variety of other documentary and artifactual materials – and employing an ever evolving conceptual and methodological apparatus. As I understand it the emic/etic distinction originated in the distinction between phonemics and phonetics within linguistics and has become generalized within anthropology, starting with Kenneth Pike, where it is generally glossed as the insider’s view of a culture, emic, versus the outsider’s view, etic. In the typical case where a Western educated anthropologist is studying a preliterate society somewhere in the world, the anthropologist is clearly the outsider. In that case the force of the distinction is to make the investigator acutely aware of the difference between their views of the world and the views of the people they’re studying. But, while we, you and I, qualify as sophisticated Western-educated investigators, the cultural tradition we’ve been examining in this letter happens to be our own. So how could the emic/etic distinction possibly be relevant? Well, perhaps it isn’t. But that’s the tool I’ve got, so I’m going to use it. And if it breaks, well, that’s OK. In the first place I note that we live in an enormously complex society containing many subcultures and that each of us participates in several of these subcultures to one degree or another. The tribe of academic Shakespeareans is one such subculture. They have various duties and produce various things, among them, editions of Shakespeare texts. While some of those editions are intended primarily for other members of their tribe, many are intended for the public at large. Jamil and Jeanette Q. Public know little or nothing about the Academic Shakespeareans. When they see Denzel Washington, Kenneth Branagh, and Emma Thompson dancing around on the screen in a movie version of Much Ado About Nothing, they likely think they’re watching something more or less created by The Bard Hisownself, albeit with a little help from Hollywood. They know nothing about what the tribe of Shakespeareans had to do to come up with the words at the heart of the shooting script for that film (nor do most of them know much about shooting scripts). But, let me ask you, when the Shakespeareans regularize and modernize the spelling they find in those old texts, aren’t they doing that because there is something foreign, something alien about them? Even the most casual Penguin paperback edition of a Shakespeare play will have its pages weighted down with footnotes glossing the meanings of words. Why? Because those words no longer exist in the language; they are foreign words that belong to a somewhat foreign language that is, however, a recognizable relative of modern English. And the culture, Elizabethan England is a very different culture in a very different society. It was a monarchy and the monarch did double-duty as head of the church. No democracy, no separation of church and state. It was a world where the difference between an aristocrat and a commoner was conceived of as a difference in kind, not merely of material circumstance and history. It was also a world in which capital punishment and torture were legitimate and common, on occasion even the focus of public spectacle. And so on for a long list of differences. The differences are so substantial that in the 1980s the tribes of literary critics created something called the New Historicism to deal with that kind of difference. Now, there’s nothing esoteric or hidden about these things. I’m not breaking any tribal oaths in telling you these things. Heck, I’m not myself a member of the Academic Shakespearians, though I’ve studied with some of them and read their books and articles. There’s little in this story that’s controversial. But, and here’s the point, these are the people who are telling Haj Ross to put meaning first, that the patterns that so engage him aren’t important unless he can relate them to a poem’s meaning. Moreover, remember that for most of their history those Shakespeare plays made their way in the world without benefit of the interpretive commentary that has become the focus of literary criticism since World War II. Those critical readings, our interpretations of those oh so carefully ‘laundered’ texts, are they emic or etic? Does it make sense to say that, with respect to Shakespeare and his contemporaries they cannot but be etic, the work of outsiders? With respect to us, that is, those of us not of the tribe of Shakespeare critics, they are emic, but they work best in that function to the extent that we forget about the apparatus that’s constructed them. Thus, when critics talk of “reading” a text, more often than not they mean, “produce a written interpretation” of a text. Sometime in the 1960s and 70s, I believe, literary critics began eliding the distinction between reading in the ordinary sense, where it’s one of the three Rs, and interpretive reading, which is something one learns through a multiyear apprenticeship among the tribes of literary critics. The effect of that elision is to disappear the critical apparatus into the mind’s dark matter. When literary critics complain that Haj isn’t concerned about meaning they are, ipso facto, complaining that he’s stepping outside the circle of mystification. When linguists work as linguists they step outside of language and examine it as an etic object, even when working on their own language. When working on their native language they may call on their emic intuitions, but their basic intellectual stance is that of an outsider. And that’s what Haj does when he’s working on poetry. For the most part he works on English poetry, generally fairly recent poetry, and he calls on his emic intuitions as a speaker of English, but his basic stance is that of a linguist, an outsider. As far as literary critics are concerned, he’s sinning. Sin!? Surely this is overblown, you’re thinking. Well, says I, it is and it isn’t. It’s a tricky business. And I think it’s high time we step back, put the whole business at arm’s length, and ask, in all humility: What are we doing? Now I want to look at a particular text, Joseph Conrad’s Heart of Darkness, which is one of the texts most frequently taught in undergraduate courses. Why is it so popular? Well, it’s relatively short, 40,000 words, which is a consideration, albeit a minor one. Surely it’s popular for its subject matter – roughly, European imperialism in Africa ¬– and, secondarily, Conrad’s impressionist style. Still, why, why do those things matter? Which is to say, literature is taught as a vehicle for cultural indoctrination. Of course you know that; you don’t need Hillis Miller to tell you that. But I just wanted to get the idea explicitly on the record along with that little (emic) irony about English literature in the United States – Miller had earlier pointed out that, at the time, American literature was marginal in the academy, at least at Hopkins. And what I’m wondering is if the original impetus behind interpretive criticism wasn’t cultural anxiety: Just who are we and what are our values? Let’s set that aside for the moment, though I’ll return to it at the end of this section. Just a bit more about Heart of Darkness, which is a relatively straight-forward story. A pilot, Charles Marlow, needs a gig. He calls on an aunt who gets him an interview with a continental firm which hires him to pilot a steamer up the Congo River to a trading station that has gone incommunicado. Marlow’s job is to make contact with the station agent, who is regarded as a real up-and-comer. Marlow is to recover the ivory that Kurtz has, presumably, been accumulating. Marlow is our narrator. Actually, he tells the story to an unnamed third party, who then tells it to us, but we can skip that detail. That third party presents the bulk of the story to us as Marlow’s own words. Marlow’s steamer is crewed by native Africans and, in addition to personnel from the trading company, there are pilgrims on board. Marlow is presented as a brilliant and talented man who went to Africa to earn enough money to make him worthy of his Intended; we don’t learn this last detail until late in the story, nor are we ever told her name. We’re also led to believe that Kurtz has gone mad, setting himself up as a demi-god to the natives and taking a native mistress. As for those natives, it is clear that they have been very badly treated by the Europeans. Whatever else is going on, Heart of Darkness is an indictment of European imperialism in Africa. And yet in 1975 Chinua Achibe, the Nigerian novelist, set off bombshells when he delivered a lecture, “An Image of Africa: Racism in Conrad’s Heart of Darkness” . How could Heart of Darkness be racist, people objected, when the text obviously condemns imperialism? Easy, goes the rejoinder, for Conrad deprives Africans of agency, depicts them only as victims, and never has even one of them speak. Now, NOW, we’ve got something to think and talk about. Heart of Darkness may be over a century old, but the issues it embodies are very much alive in this, the 21st century. Thus I note that Bentley doesn’t have an English Department, but a Department of English and Media Studies, which is a natural for a small college and thoroughly consistent with how the study of literature diversified into the study of media, though media study has other roots as well. If THAT’s what floats your boat, Heart of Darkness is a natural vehicle for instruction. As you may know, one of the great films of the last quarter of the previous century is Francis Ford Coppola’s Apocalypse Now, and it was loosely based on Heart of Darkness. Instead of Africa we have Southeast Asia: Vietnam and Cambodia. Instead of a rogue ivory trader, a steamboat captain, and the Congo River, we have a rogue army colonel, a Special Forces captain, and the Nung river, a fictional river based on a real one, the Mekong . In both texts (by convention a film can be called a text – pretty much anything can be called a text, and thus be read, but we don’t want to go there) we have a river, the jungle, and (something very like) madness. Compare and contrast is one of the oldest formulas in the book, and you can certainly employ it with these two texts . Why not add a third text into the mix? Seiho Takizawa has drawn and written a manga version that owes debts both to Conrad’s novella and Coppola’s film . Like Apocalypse Now it’s set in Southeast Asia; but it’s during World War II and it’s a Japanese colonel who’s gone rogue. Moreover, over the last two decades manga and anime have become popular in the United States (and throughout the world generally) so there’s likely to be a student population familiar with the form. Now we’ve got three texts and three different media (prose, film, manga – aka Japanese comic book). How about a fourth text? I’m thinking of the “Congo” episode of Anthony Bourdain’s Parts Unknown video series . As you may know, Bourdain is a chef turned I-don’t-quite-know-what, but he travels the world eating the local food and using that as a vehicle to introduce us to the local culture. In this episode he journeys to the Congo River and, in his voice-over, he explicitly references Heart of Darkness. The sound track uses quasi-Doors rock reminiscent of the “The End”, which Walter Murch used in the opening montage for Coppola’s Apocalypse Now, and at one point Bourdain “dubs” (his word) a boat the “Captain Willard” (from Apocalypse Now). We’re now so deep in the inner workings of culture that I’m all but lost. We’re dealing with a story written by a Pole, Józef Teodor Konrad Korzeniowski, writing in British English as Joseph Conrad, as translated into film by an Italian-American film-maker, Francis Ford Coppola, both of whom have impressed themselves on the imagination of an American-born chef of a somewhat privileged background . On the side, a Japanese manga artist has created his version of the story. How do we distinguish between mine and thine? Moreover, anxiety about cultural ‘appropriation’ seems to be running rampant. Whatever this cultural process is, it is certainly worth serious thought. In the large, of course, it’s (just) culture. More particularly we’re dealing with American culture. But, you know, in Conrad’s text, the Africans don’t speak. In Bourdain’s text they most certainly do, some in African tongues, and some in English. Now we’ve got material for a course. For that’s what I’ve got in the back of my mind as I write this, courses. What do you teach in a first level undergraduate course in English literature? Sure, you can teach Heart of Darkness. Give it a week, maybe two (I have no idea what reading lists are like these days), for there are other texts to teach. In THAT course you’re never going to get to these other texts, Coppola’s film, Takizawa’s manga, or Bourdain’s episode of culinary adventure. Maybe you can fit all four of these texts into a more specialized upper-level undergraduate course. But you could also incorporate those texts, and more  into a professional monograph. Which is to say, the kind of approach to Conrad’s text that is appropriate to an entry-level undergraduate course can, in one way or another, also be extended to a specialized monograph for a relatively small professional audience. And that approach centers on meaning: What is the meaning of these images and motifs as they are used and reused in various contexts? Why are they being used? When Hillis Miller started teaching back in the 1950s Conrad’s text was the only one of these four that existed. Even if the others had existed, they wouldn’t have been taught because the conceptual matrix that would enable and justify them didn’t exist. Heart of Darkness would have been taught as one of the great texts of Western literature, which it is. The implicit contract is that, in reading and thinking about this text, the students will be internalizing important cultural values and attitudes. The world in which Chinua Achebe could assail Heart of Darkness as racist was rapidly becoming a different world, post-Civil Rights, post-Vietnam, African-American and feminist studies on the rise, and the Western canon was being questioned. Remember the canon wars? When we teach Achebe’s critique we may not be asking students to internalize it, but we’re certainly asking them to internalize values that recognizes its validity. Apocalypse Now doesn’t really change the ethical landscape nor, I think, does Bourdain’s show, though I reserve judgment on that, as I’ve not really thought much about it. We’re now in a world where English departments are beginning to examine popular culture and to teach it. More and more humanists would talk of “cultural studies”, which is not, as I’m sure you know, quite what the term itself suggests. Cultural studies is not simply the study of culture; rather, it’s the study of certain kinds of culture from a certain, more or less, Marxist point of view. When cultural studies is good, it is, well, it is just that, good. However, and this may be pushing things a bit, it seems to me that the world of cultural studies is still a world that is dominated by canonical high culture literary texts. Yes, that canon is in question, other texts have been added, and we now examine movies, television shows, comic books, video games, and so forth. But in one way, shape, or form the central issue is that of complicity with, capitulation to, or resistance to (white patriarchal capitalist) hegemonic power. The student of cultural studies is, in part, descended from the Old Testament prophets – which is not a trope I’ve invented . For myself, if I were to write a monograph covering those four texts – Conrad’s novella, Coppola’s film, Takizawa’s manga, or Bourdain’s one-hour video – I’d frame it, not as cultural studies, but as media anthropology . Conducting an anthropological investigation of your own culture is very different from interpreting the sacred texts of your culture. Very different. But that, more or less, is where literary criticism has been heading over last half-century. At the beginning of that period it was the devoted to the somewhat mystified interpretation of quasi-sacred high culture texts – the critic as priest. While that activity still remains, it has somehow managed to elaborate itself into something approaching the investigation of your own culture as though you were a Martian ethnographer with no direct existential stake in the outcome of the investigation. The only thing keeping it from being anthropological is insisting on the insider’s stance of critique. What’s happened to the great works of the Western world? What happened to furnishing young minds with the values appropriate to American citizens? Those questions are both real and rhetorical, but I don’t ask them out of a sense the bottom is falling out of Western civilization – though, in view of the results of the last Presidential election, we’ve gotten a bit closer to that. Independently of that, I’ll say it again: it’s high time we step back, put the whole business at arm’s length, and ask, in all humility: What are we doing? Let’s now set that aside and come at Heart of Darkness in a different way, a way that’s closer to what Haj does with poems. Forget about meaning. It’s there and, yes, we will have to attend to it, but it’s not the focus of our investigation. Back in 2011 I’d spent most of July and a bit of August writing a series of substantial posts on Apocalypse Now. Of course I watched the film itself over and over, stepping through some sequences almost frame by frame, but I also listened to the director’s commentary. After having listened to Coppola mention Heart of Darkness time and again I decided that it was high time I read it. I checked it out of the library, read it, and began blogging about it. But I also, more or less on principle, downloaded a copy of the text from Project Gutenberg. I didn’t have anything in particular in mind, but I figured that, who knows? I might want to annotate a passage or two. As we’ve seen, the story is narrated by Charles Marlow, who’s piloting a steamer up the Congo River. He tells his story in default order. The first item in the story is the first thing that happened, the second item in the story is the second thing that happened, and so forth. He follows that pattern until he gets to a certain point, where he begins to jump around in time. All of a sudden I found myself reading about things that must have happened after the point we had gotten to in the story, but also before. And all of this was happening within one very long paragraph. “I wonder if this is the longest paragraph in the text?” thought I to myself. And so I decided to check. If this had been the old days I wouldn’t have checked. Counting the words by hand would have been too tedious, even for a novella of 40,000 words; and whether or not that paragraph was the longest didn’t seem like much of an issue. But, it’s not the old days. I had an electronic text on hand and I had a way of semi-automating the count. I used the word-count function in MSWord to count the words in each paragraph, entered the results into a spreadsheet, and ran up a chart. Each bar in the chart represents a single paragraph of Heart of Darkness. The length of the bar is proportional to the number of words in the paragraph. The left-to-right order of the bars is the beginning-to-end order of the text. 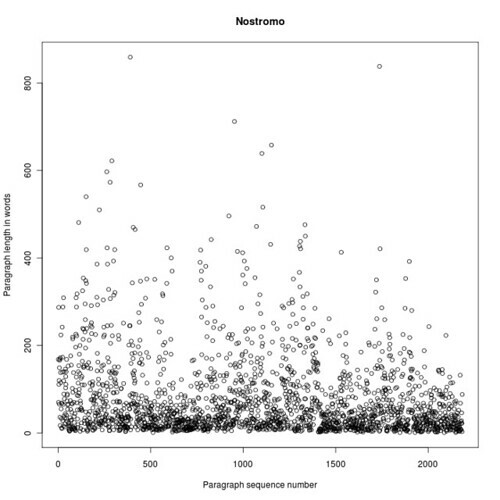 The number of words per paragraph ranges between two and, I believe, 1532. There, in the middle, that 1532 word paragraph is the one I’d been examining. It’s longer than any other paragraph by a significant margin. 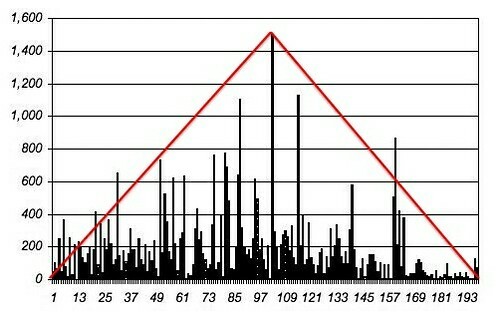 Moreover, while the distribution is quite spiky, it does seem to have an overall pyramidal form, which I’ve indicated in red. Where’d THAT come from? Is it real? For years one of the major issues in literary criticism has been whether or not the meaning a critic finds in a text really is in the text, or just placed there by the critic. Well, that graph is not about meaning, and, given the way I created that chart, it’s hard to see how I could have foisted that shape on the text. All I was looking for was to determine whether or not a certain paragraph was the longest one in the text. That pyramidal shape was a complete surprise. Do we know anything about paragraph length in texts? I didn’t know, but I figured there might be someone hanging out at Language Log blog who does know. As soon as I’d posted my ‘discovery’ at New Savanna I sent a link to Mark Liberman at Language Log, who in turn did a post on the topic . The post generated a long, interesting, and somewhat contentious discussion. From that discussion it seems that not much is known about paragraph length in documents. That is, the population of people who post and comment there didn’t come up with any work on the topic. That doesn’t mean there is no work, but given the interests of the people who post and comment there, it’s a pretty good indication that paragraph length is a prominent topic of investigation. Mark was kind enough to do a bit of sleuthing on his own. He did the same chart for Conrad’s Nostromo (Figure 2). 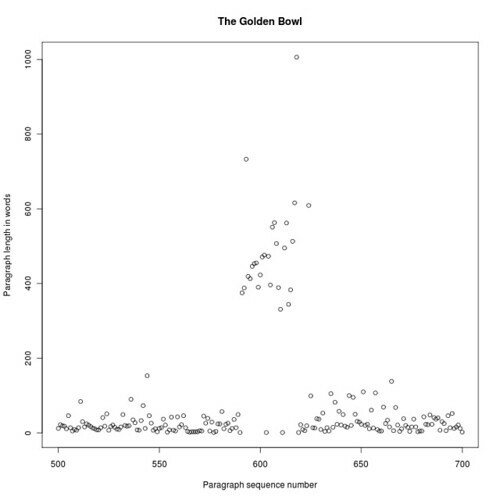 It’s a longer text, over 2000 paragraphs vs. 193; and Mark plotted lengths with dots rather than bars. There are two very long paragraphs, over 800 words long, and a bunch between 400 and 800 words long. But there doesn’t seem to be any overall shape to the distribution. If the Heart of Darkness distribution had been more like this, that would have ended my interest in it. That’s quite clear. Something’s going on. Though I’ve not read The Golden Bowl, I’ve taken a quick look through the text. The book is divided into six main sections each of which opens with a stretch of conspicuously long paragraph. That second chart spans the opening of the second section and those long paragraphs – roughly 300 to 1000 words long – are at that point in the text. James appears to open these major sections with a different prose rhythm and that likely accounts for much of the clustering that appears in the first chart. What do we have so far? We have three texts and three different patterns of paragraph length. In one case, Nostromo, there is no apparent pattern. In another case, The Golden Bowl, we appear to have two regimes which alternate, one where paragraphs are mostly under 200 words long and another where they are mostly over 200 words. In our third case, Heart of Darkness, we have a pyramidal distribution where the longest paragraph is conspicuously longer then the next longest ones. I further note that I have just found out about some work published by a group of Polish scholars in 2015. They looked a sentence length in 113 literary texts in seven languages . Sentences and paragraphs, of course, are different textual units; but they are same kind of thing, a string of words, and sentences are constituents of paragraphs. 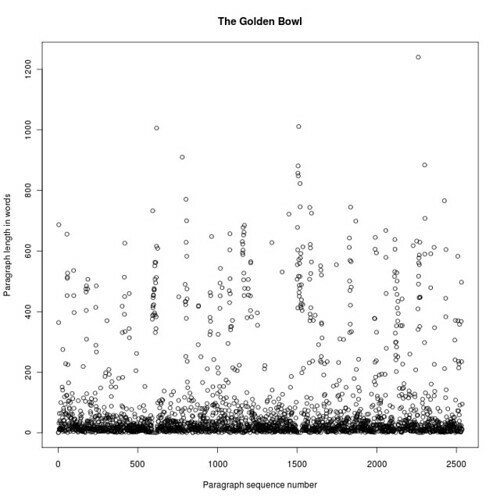 Sentence-length variability was not random, but rather displayed fractal-like patterns. The math is beyond me, alas, though I have some general familiarity with fractals. But some of the charts in the article have the spikiness we see in Figure 2, though without the overall pyramidal envelope. Something appears to be going on, but just what, that’s not at all clear. Let’s return to Heart of Darkness. As I indicated at the outset I was attracted to that particular paragraph because it violated the otherwise progressive order of events. But there’s more going on than just that. The story takes us on a journey up the Congo River to reestablish contact with a trading station that has gone silent. Marlow is to recover the ivory that, presumably, has been accumulating there and retrieve the head of the station, Mr. Kurtz. For the first half of the text Kurtz is little more than a mystery attached to name. This longest paragraph just happens to be the first time we learn much of anything about Kurtz. It’s a précis of his personal history. The paragraph is not only very long, but also contains crucial information. I’ve come to call it the nexus. At this point in the story the steamer is only a couple hours away from Kurtz’s trading post. Suddenly the ship is attacked by natives on the shore. They’re shooting arrows and throwing spears. One of the spears catches Marlow’s helmsman in the chest – if you’ve seen Apocalypse Now, you’ll remember a scene in the movie modeled on this one in Heart of Darkness. The helmsman drops to the deck, bleeding profusely. It’s at this point Marlow interrupts his narrative to give us Kurtz’s capsule history. When he’s finished with that history, what does he do? He returns to his helmsman bleeding out on the deck and pushes him overboard. This nexus paragraph is thus very strongly marked. I find it hard to think of this confluence of features – longest paragraph, centrally situated, personal history of central character, flanked by a bloody death – as being accidental. Whatever process is at work here strikes me as being deliberate, albeit most likely beneath consciousness. No; I can’t forget him [Kurtz], though I am not prepared to affirm the fellow was exactly worth the life we lost in getting to him. I missed my late helmsman awfully,—I missed him even while his body was still lying in the pilot-house. Perhaps you will think it passing strange this regret for a savage who was no more account than a grain of sand in a black Sahara. Well, don’t you see, he had done something, he had steered; for months I had him at my back—a help—an instrument. It was a kind of partnership. He steered for me—I had to look after him, I worried about his deficiencies, and thus a subtle bond had been created, of which I only became aware when it was suddenly broken. And the intimate profundity of that look he gave me when he received his hurt remains to this day in my memory—like a claim of distant kinship affirmed in a supreme moment. Marlow is weighing Kurtz’s (European) life against that of the (African) helmsman. One could argue that, to the very large extent that Heart of Darkness is about European imperialism in Africa, those lines constitute the moral fulcrum of the story. I could say more about the pattern of paragraph lengths in Figure 2. I’ve got some thoughts about the run of short paragraph at the very end (to the right), which is a conversation between Marlow and Kurtz’s fiancé, and I’ve recently had an idea about the second and third longest paragraphs, the ones that flank that longest paragraph. I’ve also taken a look the distribution of the name “Kurtz” in the text, which appears to be periodic. Let’s set all that aside . where X is the structural center and the other elements are symmetrically deployed about that center. Notice, however, that while the symmetry is obvious in visual display, narratives don’t exist that way. They move from the beginning, though the middle, to the end and there is no way to “step back” from the ongoing story so that you can “take in” the symmetry “at a glance.” That’s what makes it so interesting, and puzzling. What kind of temporal process is structured like that? 1 Frame, 2 Main Tale, 3 Nexus, 2’ Main tale, 1’ Frame. But I’m not sure I believe that. I’m pretty sure of the structural significance of the nexus paragraph though. I want more examples so I can compare them. I see no reason why center loading should take only one form. The only way to find out is to consider a variety of examples and that, for better or worse, is an open-ended job that could easily absorb the attention of many critics over a period of years, if not decades. One example I’m considering is, guess what? Shakespeare’s Hamlet. Back in 1972 one Mark Rose had published a slender volume, Shakespearean Design (Harvard UP), in which he examines Shakespeare’s dramaturgy. He’s not interested in what the plays mean, but in how scenes play against one another, how they run in parallel or echo one another. Rose devotes a chapter to Hamlet and in effect demonstrates that the play is a ring composition. He doesn’t make that assertion, but R. G. Peterson did a couple of years later in a literature review, “Critical Calculations: Measure and Symmetry in Literature” (PMLA 91, 3, May 1976: 367-375). He mentions Rose’s book in the course of discussing ring-composition and points out that Rose’s analysis amounts to an assertion that Hamlet exhibits ring-form. Until quite recently no critics had attempted to verify that description, despite the fact that Shakespeare is at the center of the Anglophone literary canon and that Hamlet is at the center of the Shakespeare oeuvre. Late last year, however, James E. Ryan published Shakespeare’s Symmetries: The Mirrored Structure of Action in the Plays (McFarland 2016), in which he argues that not only Hamlet, but 25 other plays exhibit ring-composition. He cites Rose of course, but there’s really no one else to cite on this particular point. I now own the book, and have glanced through it here and there, but I hesitate to read it. Why, given that I am biased in favor of this thesis? Because it’s been years since I’ve read Shakespeare’s plays. Without having the plays fresh in my mind, I cannot reasonably judge Ryan’s analyses, and, for various reasons, I’m not at the moment interested in re-reading that much Shakespeare. It’s a bit too early for reviews to appear in the formal literature, but I’m not holding my breath. But, as I said, I’m considering taking a look at Hamlet? Why? Not simply because it’s an important play, but because it exists in three significantly different versions. Does each exhibit ring-composition? I don’t know. From my point of view the existence of three versions is an opportunity to learn something. That is a contrast with standard critical practice, where it presents a problem for the rather Platonic notion that texts have one best form, and that Ideal Form the proper object of our critical attention. What do I expect to learn from the study of ring-composition? In the first place I don’t think that ring-composition is the only thing worth looking at. I’m looking at it because it is something that has both been identified in the literature and has, at the same time, been neglected. Ring-composition is a fairly specific thing to look for – Mary Douglas has even identified diagnostic criteria (Thinking in Circles, pp. 35-38). I am interested generally in literary form (morphology) and published a long essay on the subject about a decade ago . So, I’m generally interested in describing the formal features of literary texts. Ring-composition is just one identifiable feature, one that exists in an interesting range of examples. I study it because it is convenient to do so, which, for example, is why geneticists study fruit flies. Ultimately I’m interested in the mechanisms of the literary mind. But, as you know all too well, mental mechanisms cannot be examined directly. Early in my career I had discovered a complex and symmetrical structure in Coleridge’s “Kubla Khan” . By that time I knew something about generative grammar, but I’d also taken a course in computer programming, where I had practical experience in a domain where the difference between, say, a comma and a colon, implied a difference in some process. There were aspects of that structure in “Kubla Khan” that just “smelled” like computation. And so I went off to get a degree in English at Buffalo and found that the department would allow me to apprentice myself to David Hays in the Linguistics Department. Through Hays and his students I learned about computational semantics. I learned enough to examine a Shakespeare sonnet , but not enough for “Kubla Khan”. As far as I know, that knowledge doesn’t (yet) exist. We’re going to need to know a lot more about the mind before we can understand the mechanisms underlying literature. I don’t see how we’re going to get there unless we have better descriptions of literary texts. There’s little point in proposing mechanisms to account for some phenomenon unless you have good descriptions of that phenomenon. We need better descriptions of the patterns in literary texts. That’s what Haj Ross is interested in. That’s what I’m interested in. There are a few others, but not many. Let’s return to the undergraduate classroom. I’m imagining that I’m teaching a first level literature course where Heart of Darkness is one of the texts. Do I introduce that chart in Figure 2, Paragraph Length in Heart of Darkness? It’s easy to explain and it’s easy to point out that longest paragraph, the one I’ve called the nexus, in the text. Beyond that, though, what would be the point? You don’t need that figure to draw students’ attention to the nexus. And once they’re examining that paragraph, they’re attention is ipso facto called to the general outline of Kurtz’s story. Nor do you need that figure to point out that the nexus is inserted into the text as a digression within the death and disposition of the body of the native helmsman. Given that we are examining that paragraph, there two things we can do. On the one hand we can continue talking about what’s going on in the story, a vignette of white colonialism in action. But we can also segue into a discussion of Conrad’s craft. How very clever of Conrad, why’d he do it? What’s the effect? Here it seems to me that the basic context of understanding is and must be the world at large: life. That’s why we read books and watch movies, to get an experience of/about life that is somehow illuminating. And the basic conversation must be, in one way or another: How does this text illuminate life? I don’t see that the pattern of paragraph lengths contributes much to that conversation. In that conversation, that chart is just an odd fact that hangs there like the filament of broken light bulb. No illumination. However, by the time I’d stumbled into that chart I’d spent years thinking about language as language, rather than using language to communicate with others. I’d spent years studying perceptual, cognitive, and neuro-psychology. And I’d spent years thinking about literature as language and as a manifestation of the mind’s power to shape experience. And that’s different from thinking about literature as a means of illuminating life. In the latter case you’re looking at life. In the former not only are you looking at the mind, but you’re assuming that the mind has intrinsic powers grounded in its nature, whatever that is. Whatever you may think of Chomsky’s language acquisition device, it’s a strong hypothesis about the mind’s intrinsic powers and it’s stated in terms that didn’t exist prior to mid-century work in mathematical logic. While I no longer believe in Chomsky’s generative grammar, I still look at language, and literary texts, as a source of clues about the mind’s intrinsic powers, and I do so in (more or less) mechanistic terms. I believe that those intrinsic powers require mathematical explication, though I’m not going to be doing that myself. That’s the context in which I saw that chart. That’s a context that simply doesn’t exist for freshmen and sophomores – nor, for that matter, does it exist for most literary critics. With that background that chart is one more clue to some underlying mental process. Without such a background, that chart is just an oddity. Now, if we actually knew about those mental processes, one could use them as subject matter in a course. But that course wouldn’t be a basic literature course. Rather, it would be an upper division course about the mechanisms of the literary mind for lit majors, psych majors, or for others ‘with instructor’s permission’. Literature as mental mechanism is a very different subject from literature as equipment for living (the latter phrase, incidentally, is the title of a classic pre-WWII essay by Kenneth Burke). We’re now back at J. Hillis Miller and his reflections on the profession . He talks of the humanities as being “especially charged with the combination of Bildung and Wissenschaft, ethical education and pure knowledge” [p. 65]. I rather suspect that, for Miller, literary criticism is a one and the same time both Bildung and Wissenschaft. I don’t think that’s tenable anymore. Both are important. But the contexts are different. When we require undergraduates to take literature courses we do so for ethical reasons, where I mean “ethical” in the broadest sense, ethos, a way of life. How should we live? – that’s the question. In THAT context all the questions I raised about Shakespeare’s texts are niggling details. It really doesn’t matter much just which Shakespeare texts 1st or 2nd year undergraduates read, nor does it matter that they know about the issues surrounding those texts. It matters that those texts have been prepared by competent professionals, sure, but those undergraduates need not know what’s entailed by that competence. Otherwise what matters is that they read the texts and (learn how to) think seriously about them. Now, at this point you need to know that, at least since the 1930s, academic literary criticism has been doing a complex dance with “science”. The scare quotes are quite deliberate, for the partner in this dance isn’t so much science as it is actually practiced (in such diverse disciplines as physics, biology, or, say, sociology) but some ideologically defined Other. From one point of view literary criticism is emphatically NOT science. From another point of view, literary study is as fully coherent and rigorous AS science. This dance is not quite nonsense, but it’s maddening and incoherent. One consequence of this dance is that, back in the 1950s, if not before, literary criticism forswore, well, criticism, the passing of value judgments. They’re subjective and ephemeral, so the reasoning went, and furthermore they’re the province of, ugh!, journalists. We are not journalists. This disavowal of value didn’t work very well. It’s impossible to read the various identity-based literary criticism of the last half century – feminist, African-American, and so forth – and not see (implicit) value judgments all over the place. Bring back explicit statements of value preference, not only about what makes good art, but how one ought to live (obviously, they are closely related). Call it ethical criticism and make it the core of undergraduate instruction in literature and other art forms. The context: how to live one’s life – though you need to be careful not to impose one’s own values on students. I’m pretty sure that there’s a research angle here as well, but that’s more than I can assay here. But I note that figuring out just what values are available and how one is to rank them is far from obvious. At the same time we need to recognize naturalist criticism as a different, well, animal. Here one treats literature as a phenomenon of the natural world on a par with the sun, the oceans, bacteria, and eucalyptus trees. This is where you look at patterns of language in literary texts and seek to describe them. This is where you attempt to figure out how it is that human brains take pleasure in reading such texts. Here the context is not living one’s life; it is the intrinsic properties of neural tissue and the imperatives of coherent brain processing. Now, I’m talking as though there were a categorical division between ethical and naturalist criticism. It’s not that simple and neat. And I can hear any number of literary critics violently whispering in one ear or another, but of course we’re interested in literature as mental process, you ninny! . Well, yes, they’ve got a point. And what of the Lacanians? I’m guessing they’re no more your cup of tea than they are mine, but you can’t say they’re not looking at the mind. Or can you? As this letter has gone on far too long, this is not a discussion I want to entertain . The crucial point, though, is a simple one: Whatever their conception of the literary mind, it is not one that leads critics to undertake careful descriptive study of literary texts. By way of comparison I offer all those journalists who write about their pet peeves about how English is spoken or written. You can’t say they’re not interested in language. They obviously are. But they’re not interested in language in the way a linguist is. The comparison is a bit unfair to the literary critics, but the fact remains that have trouble conceiving of literary texts as linguistic objects with formal properties worthy of their attention. I offer another comparison, Renaissance astronomy. They managed to keep the geocentric model spinning by adding on epicycles. That’s what the literary cognitivists are doing. Their literary mind is a mind that’s focused on the world, rather than reveling in the exercise of its own properties. Why can’t they attend to those properties and make them the center of their investigation? It’s the difference between thinking of the mind’s powers as having instrumental value in dealing with the world versus a conception that thinks of the mind as wanting to have fun. Of course, when it comes time to explain things, we need to explain why having fun is so very important to the health of brains and the people who have them. Perhaps having a library of well-described texts will help us understand that. But you know what, Dan, I hear another chorus of violent whispers: but of course we know that the mind wants to have fun! I don’t believe them, Dan. I don’t believe them. Perhaps they know it as private individuals. But as academic professionals, they haven’t got a clue. J. Hillis Miller, My Fifty years in the Profession, ADE Bulletin, No. 133, Winter 2003, p. 64. A great interpreter like Erich Auerbach, a great critic-scholar like E.R. Curtius, a prodigal son like Kenneth Burke, or men of letters like Paul Valéry and Edmund Wilson, who practiced the minor mode of prophecy we call criticism, are not annulled by the fact that they may be explicitly writing about the writing of others. The words atheists use is deconverted, or entkehrt in German. 🙂 That’s another surprising discovery: the Pirahã don’t have a religion. They believe in ghosts, but only when everyone sees them at the same time; that’s it.